Dorrington was a historic stopping place on the Big Tree-Carson Valley Road and a toll station from the 1890s until 1910. Noted for its ice cold spring, it was originally called Cold Spring Ranch. The property was sold to John Gardner and William A. Gibson in January 1868. Known as Gardner’s Station when a post office was established in 1902, the Post Office Department objected because there were so many others of the same name, so the maiden name of John Gardner’s widow, Rebekah Dorrington Gardner, was chosen for the hamlet instead. Gardner built the existing Dorrington Hotel in the late 1880s after his original hotel across the road was destroyed by fire. 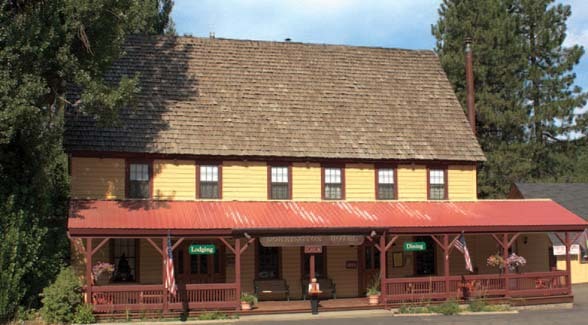 The hotel served as a depot for stockmen and as a summer resort for guests visiting the giant sequoias at Calaveras Big Trees State Park. Today, the Dorrington Hotel continues to accommodate overnight guests in its beautifully restored historic rooms, and serves meals in the downstairs restaurant. Legends persist that the ghost of Rebecca Dorrington Gardner haunts the premises. The Lube Room Saloon next door is a classic Sierra tavern that serves a full bar, as well as bar menu. There is also a small general store for the traveler’s convenience. Across the street the Dorrington Inn offers private A-framed cabins for rent.